Oh my goodness y’all, it has been ages since my last post, and for that I apologize. This whole full-time-employment thing is a real energy sucker (they don’t really warn you about that in your Art of the Harlem Renaissance seminar) and I’ve also been working on a few other writing projects, namely articles about Steampunk. Yes, I just outed myself. No, I do not feel any shame. Anyhow, I’ll be catching up over the next few weeks. I have many a joint to review because, people, I eat a lot. First up: Piazza Italia. I work in the Brightleaf area and am determined to eat my way through the complex. My friend AL, who has been harassing me to write this review for some time, and I hit up Piazza Italia for lunch a few weeks past. The space is quite lovely, perfect for medium-sized parties and events. The main room is themed in more of a central Italy Tuscan-Roman style, while a backroom holds the seafood themed section of the restaurant (called Piazza di Mare) and has a more Minoan look to the walls. Piazza Italia does pasta extremely well, and has some excellent moderately-priced lunch selections. For $9 you can choose a pasta shape of your choice, a sauce of your choice, and for an extra $3 a meat topping of your choice. 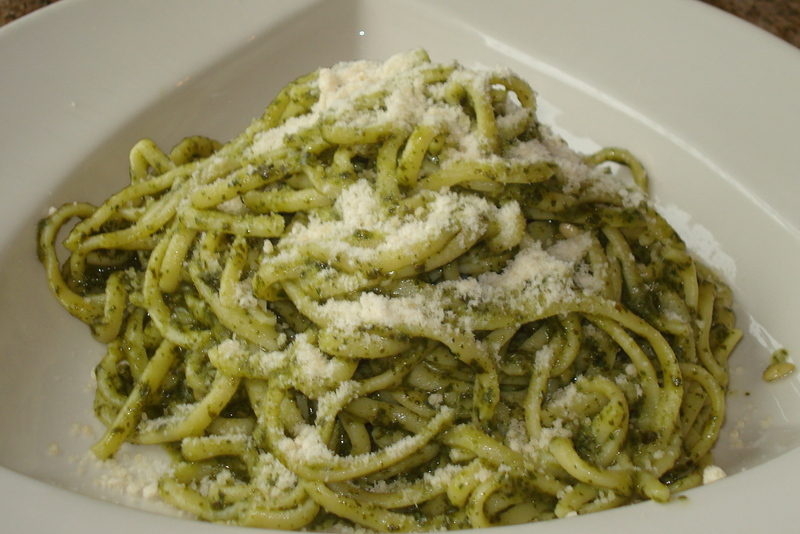 AL chose linguini with basil pesto. The pasta itself was good, extremely fresh, and cooked perfectly al dente. The pesto was serviceable. 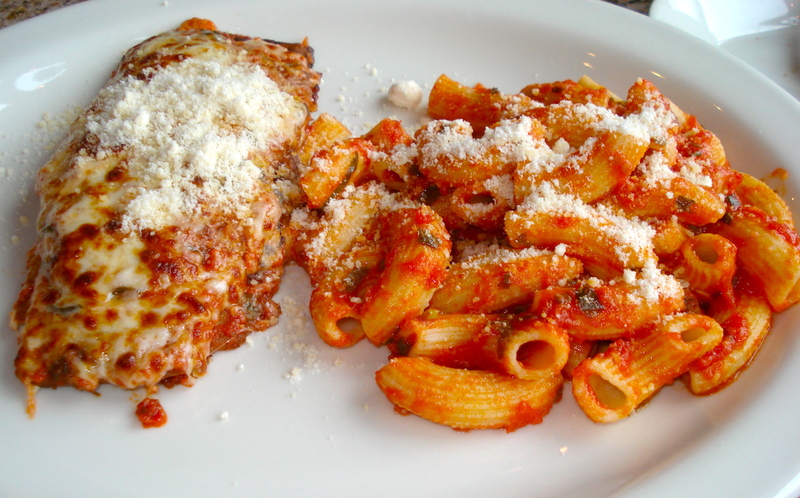 I chose one of the lunch combos, eggplant parmigiana with a side of pasta. The menu lists the pasta side as spaghetti with pomodoro sauce, but I was able to swap the spaghetti for rigatoni (I dislike long, thin strands of pasta). I thought the eggplant was done quite well; it was not over-breaded and still tasted like eggplant. The pasta was, like the linguini, fresh and perfectly cooked, and I thought the pomodoro sauce tasted bright and summery. Neither dish, I’m afraid to say, was jump out of my seat memorable. However, it was all simply-made and well prepared, which are often the marks of good Italian food. Not every meal needs to be mind-blowing. I have to admit that my favorite part about my meal was that they served the bread with a side of roasted garlic in the bulb rather than olive oil or butter. As you may now know I believe in eating as much garlic as possible, and so was more than pleased to slather garlic straight onto the bread. The garlic etc. was brought fairly quickly after we were seated, and the rest of our service was just as prompt. This was likely because the restaurant was near empty, a bit of a surprise, but then again it was early on a Tuesday. Piazza Italia also offers fresh pasta to go and a very tempting array of gelati, also featured at the nearby Amelia’s (the owners also run Chamas, the Brazilian steakhouse). Appetizer of Italian antipasti, a roasted eggplant and onion dish (delicious), grapes, sun-dried tomato with tapenade, and a lovely, simple, marinated chicken mini-panino. Warm lobster salad with big, fresh chunks of lobster over spinach, and seedless cucumbers, dressed in an amazing lemon butter tarragon sauce. This was fantastic and memorable, though a bit over-dressed sauce-wise. Fettucini alfredo, excellent pasta, not too heavy of an alfredo sauce (a positive). A beautiful dessert of gently lemon flavored vanilla gelato over a light cake, dressed with chocolate sauce and a sprig of rosemary. Ever since I tried the rosemary softserve at Momofuku Milk Bar I’ve been a fan of rosemary in dessert. Okay y’all. Go to Piazza Italia for dinner. Go all out. Get a seafood salad. This is the way to do it. Lunch is serviceable, dinner was amazing, and I am so glad I got to eat this feast before publishing this post!